I’ve been eagerly awaiting the second in the “Inspector Lascano trilogy”, as after the first (Needle in a Haystack) I was agog to discover how there could be such a trilogy. 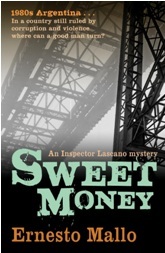 It takes a chapter before Sweet Money reveals what happened to Lascano after the end of the first book – and I am sure it is not providing any spoilers if I write that he did not die, but has spent some considerable time in a secret location, recovering. Chapter 1 is about someone else who has spent some time removed from society, but for a different reason. Miranda (Mole) is a criminal just about to be released from prison. He’s survived the experience on his wits, but has a few immediate priorities – whether he has AIDS, where his stashed money is, and whether he can return to live with “the Duchess”. Hence, both Miranda and Lascano emerge into a transformed world compared with the previous novel. Then, Argentina was under control of the military junta, in which people were abused, killed and their children kidnapped in a regime of terror. Now, there is a democracy, but those who benefited from the previous rule have in many cases managed to protect themselves and even flourish in the newly but superficially carefree and materialistic land. As well as following Lascano and Miranda’s lives and thoughts during the first days of their “freedoms”, the first half of the book provides much back-story from the first, as well as re-acquainting us with the odious Giribaldi, who has been dismissed from the military in the new reforms, with his strange wife Maisabe and distanced son Anibal. These are desperate people living apparently normal lives, in common with almost all the characters in this novel. Everybody is on the edge, and one waits for something to blow. The action truly takes off in the second half of the book, when the rather meandering recaps of the first part, with descriptions of Miranda’s planned “final” heist so he can live together again with the Duchess and their son; and Lascano’s mourning for his lost Eva, gives way to a burst of plot involving layers of corruption and small glints of possible honesty among police, the military, the judiciary, and various sets of criminals. Lascano and Miranda circle each other, recognising that they are on different sides of the fence yet hold to a common code more honourable than many of those in authority. Both of them have the goal of seeking peace and fulfilment with the women they love, but can either of them possibly achieve it given the dangers they are both in, and the precarious hold they both have on life in the political-criminal maelstrom of Buenos Aires? I liked this book very much, particularly the plotting in the second half, and its sense, conveyed with sharp yet occasionally poetic prose, of a volatile society on the edge. As with the first novel, the dialogue is mostly in the form of italic text, perhaps to emphasise the stark differences in what people say, and what they do or think. One also has to pay attention throughout as most of the characters are known by two or three names, interchangeably, many of them beginning with M which does not help! The subplot about Eva’s family is moving, and though there is little to be cheerful about in this cruel and violent era, at least there is a hope in the twists of fate that weave through the novel that one person’s life will be changed for the better by Lascano’s actions. I purchased my copy of this book. The publisher, Bitter Lemon, is excellent in bringing us much translated fiction, but as a specialist in this area but I do think they should name the translator of the books listed on their website and on Amazon. About Sweet Money at the publisher’s website. Read other reviews of Sweet Money at The Bookbag and The Game’s Afoot. Read reviews of Needle in a Haystack, the first in the series, here at Petrona and at: Euro Crime, Reactions to Reading, International Noir Fiction, Crime Scraps and The Quarterly Conversation. Needle in a Haystack is on the shortlist for the 2011 CWA International Dagger award, winner to be announced at Harrogate crime writing festival later this month. Maxine, thanks for a very interesting review. I’m glad you liked it. I have always the doubt if the translation is able to adequately convey the original. But it seems that Katherine Silver has done an excellent job. So far as I can tell, she has, Jose Ignacio. Jethro Scoutar translated the first novel, and I think Katherine does just as well, if not slightly better, in this one. Where is Eve? Last I knew she had run away. Does she reappear? Also, on a slightly different note, must I read Water-Blue Eyes before reading Death on a Galician Shore? It’s about how much I can purchase and read before the Daggers are announced? I’d like to read the second book first. Does it matter? Thanks much. Thak you very much for your review. Your review helps me to write the third one of the Lascano saga wich I’m about to finish these days. Thank you for your kind note, Ernesto, and for the news about book 3 which I’m eagerly awaiting! Maxine – Thanks for this terrific review. The author needs a delicate touch, I think, to give the right amount of character buildup and backstory; too much and it weighs the story down. Not enough and it’s disappointing. I’m glad the balance in this story didn’t take away from it for you. And thanks for bringing up the volatile atmosphere of that era. I think many people don’t know or don’t remember how much “on edge” Argentina was at that time. Thanks for the review. It sounds that it would be difficult to figure out who is who in this. Yes, of course, no answers on the next book. I must admit I liked Eve and got concerned about her whereabouts, but I’ll read this book, although my library system is budget-cutting and barely any global fiction will be purchased. So I will find a way to find out about her. Just finished Ariana Franklin’s first book, and although I am not a fan of historical crime fiction, this book was very different from any I’ve seen. That character, a 12th-century woman doctor stood up for herself very strongly, promoted women’s equality and espoused scientific and rational reasoning as opposed to superstition and other unscientific thinking. There is a lot to this character. The author, Diana Norman aka/Franklin, must have been an incredible woman, to have written this series with the ideas it espouses and the wit and good humor. I’m looking forward to reading the Mallo, which I have on hand. I’m sure there must be other authors writing about South America, but it’s a place I don’t often come across in the books I usually read. Argentina in the 70s was indeed a dark place! And only because I recently bought it–Domingo Villar’s first book is readily available here in the US. His newer book is only available on the Kindle, however.